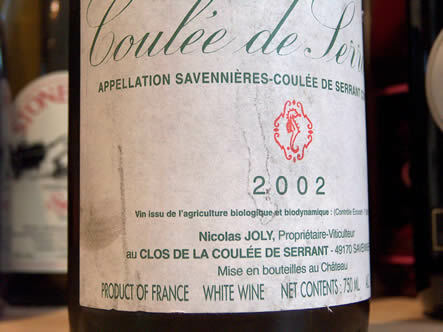 Nicolas Joly’s Clos de la Coulée de Serrant is an unusual wine. Unusual as in good, though. [Pinot Noir from the Hebrides is unusual, but that doesn’t mean it has any merit.] It’s a dry Chenin Blanc with its own appellation, from the Savennières region of the Loire, made from grapes grown biodynamically. One of Joly’s claims is that his wines improve after opening and can be kept and enjoyed for many days. The instructions on the label are to serve this wine at 14 degrees Centrigrade after decanting. I decided to test this extended drinking window idea. I disciplined myself to just a glass a day, keeping the 2002 vintage of this wine open for six days and writing notes, to check the wine’s evolution. Surprisingly, the wine does stay good over the entire period. It doesn’t just oxidise and die, like most other wines. Perhaps M. Joly is indeed correct? There aren’t many dry white wines that taste impressive six days after opening. Day 2 A waxy, herby, marmalade nose. The palate is more rounded and savoury, with quite a thick texture and a dry, herby finish. Really long, with tangy acidity. Day 3 Sherryish sweet apple and caramel notes on the nose, with hints of pear. The palate is soft and rich with a disntinctive acid tang. Savoury and intense, this is a bit more oxidised in character. Day 4 Distinctly nutty this evening, with a lifted acid edge and some sweetness. Lemony fruit. The palate is savoury with a spicy vanilla richness. Tastes really good tonight with lots of concentration and high acidity on the spicy finish. Day 6 Deep yellow/gold colour. It smells like a dry Sauternes, with spicy apricotty fruit and a nutty, slightly oxidised character. The palate is dery, with high acidity keeping it fresh and lemony. This carries the nutty, tangy, herby fruit well. It’s a striking, complex wine that hasn’t suffered too much from being open six days. A brilliant match for Parmesan cheese. Much more complex warmed up; don’t serve too cold.